Five years after facilitating the signing of a peace agreement between the Sudanese government and the Sudan People’s Liberation Army/Movement, or SPLM/A, the U.S. government is once again engaging with the two Sudanese parties to prevent renewed conflict in Sudan. As part of Enough’s ongoing desire to present multiple perspectives on peace in Sudan, former State Department official Jeff Millington offers a retrospective look at the strategy pursued by the U.S. government from the late 1990s to 2005 that produced the Comprehensive Peace Agreement. Millington served in a variety of roles at the State Department during this period, including director of the Office of East African Affairs and Charge d’Affaires at the U.S. Embassy in Khartoum. This report reflects the personal views of the author and do not necessarily represent those of the Enough Project or the United States government. However Millington’s reflections on why previous U.S. diplomacy was effective are critically relevant for the situation today. As the Obama administration works to push the two Sudanese parties toward agreement on a number of flashpoint issues, the determinants of previous diplomatic success are worth remembering. These included engagement at the highest levels of government, thoughtful coordination with key international—especially African—actors, a diplomatic strategy that was focused on the objectives of the two parties, and a clear chain of command from which U.S. policy originated. Millington’s narrative is a hopeful reminder that with robust diplomacy, peace in Sudan is still possible today, but that high-level attention to Sudan will need to be sustained over the long term in order to help ensure a peaceful future. The 2005 signing of the Comprehensive Peace Agreement, or CPA, for Sudan ended a war that had dragged on for twenty years, devastated southern Sudan, and cost the lives of two million people. The horrors of the war are not now as vivid as they were when the fighting and killing were taking place, but the human suffering in southern Sudan caused by indiscriminate military attacks, starvation, disease, and displacement was unimaginable. There is no doubt that the signing of the CPA saved thousands upon thousands of lives. 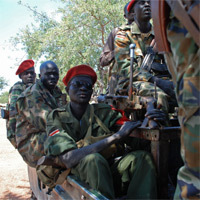 It also created the hope for a lasting peace that would give the people of southern Sudan control of their own destiny. Ending the North-South war in Sudan was a major diplomatic achievement for the United States. Both the Clinton and Bush administrations invested heavily in Sudan. The process was long, complicated, and politically contentious. But the United States persevered and demonstrated exceptional focus, consistency, and operational effectiveness. Whether by design or happenstance, the U.S. team did a lot of things right on Sudan and peace was the result. Unfortunately, many of the practices which characterized our efforts were not carried on after the signing of the CPA, and the impact and effectiveness of U.S. Sudan policies in the following years suffered as a result. The intention of this paper is to examine the operational principals and sense of commitment that framed the U.S. diplomatic initiative from 1998 through 2005. My aim is not to find fault, but to contribute to the ongoing U.S. engagement on Sudan, an engagement that is rightly focused now on the January 2011 referenda, but must continue past the January votes to the point (many years out) when peace and stability are firmly entrenched in all of Sudan. The following analysis is a personal one and is based on my involvement in Sudan that stretched from 1994 to 2005 and my participation in the development of Sudan policies under the Clinton and Bush administrations, the Danforth initiative, the ramping up of Embassy operations in Khartoum, and the Kenyan-led Intergovernmental Authority on Development, or IGAD, negotiations.